I gave out the map you see above (larger version below) to create a flow through the space. People could begin by walking up one of the walls, reading about either my dad's (on the left) or my mom's (on the right) experiences, which were written out on enlarged calendar day boxes, hung along the top of the walls. 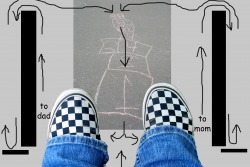 Once a person walked up and around the other side of the wall and back into the middle, to get back down, they were directed to use a hopscotch board that ran down the middle of the ramp. They could then travel along the other wall. 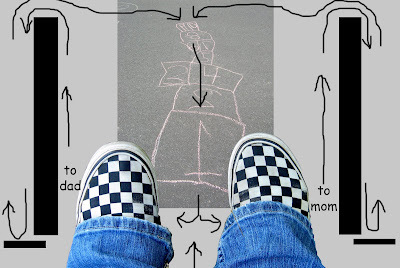 The map directed people where they could listen to each podcast as it related to what was on the walls, since one was "to dad" and the other was "to mom." You can listen to them without downloading them below. To use: In itunes, next to the File menu, click on Advanced and then Subscribe to Podcast. Copy/paste the above url into the window that pops up. There should be two podcasts/episodes, but when I first linked my itunes, it only downloaded one of them. In order to get the second, it's easiest to do from the list view (change this from the buttons to the right of the "now playing" box) and then you should be able to check off both episodes. Then all you have to do is sync them up to your ipod. Other mp3 players such as the Zune or Zen should have comparable steps. Most interfaces should make it pretty easy to do. Listed below are the narratives of my mother and father, as I have interpreted and observed in my life. These were hung from the railings along the top of the exit ramp walls (the black bars in the map) for people to walk past and read while listening to the corresponding "to dad" and "to mom" podcasts. The numbers correspond to the calendar day upon which each statement was written. 3. Sometimes I feel like I'm being selfish, but I don't think that I am. 6. I want to see them. I want to spend this time with them. 7. They spend almost all their time living with their Mom. They have dinner with her almost every night of the week. All I want is to make sure that I do get to see them on the days that we've agreed to. 11. I had to switch weekends since I have to be away for business when I would usually see them, and I understand that it's not the most convenient for her, but it's the only time I can see them. 14. I think their mom makes them feel guilty for not being with her. I don't think she does it on purpose, but she does do it and I think they both need to be more aware of when that is happening and let her know that she's making them feel bad. 21. I'm just frustrated because now it seems I'll only get to see them for one night this weekend. It's because their Mom didn't tell them until last minute that their Grandparents were coming over. And I understand Grandpa isn't doing well, and that the kids want to spend time with him, but she shouldn't invite her parents over and just expect that the kids can then just stay there a few extra days. That's totally disrespectful of our plans. 24. 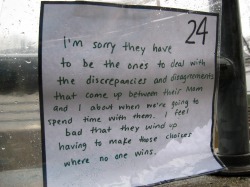 I'm sorry they have to be the ones to deal with the discrepancies and disagreements that come up between their Mom and I about when we're going to spend time with them. I feel bad that they wind up having to make these choices where no one can win. 29. Honestly, I don't think my requests are unreasonable. I just miss my kids and I wish I could spend more time with them. 1. It's really important that we spend this Thanksgiving together as a family because the first holidays are the hardest. I don't know if their father understands. 4. Grandpa's not going to be around much longer. 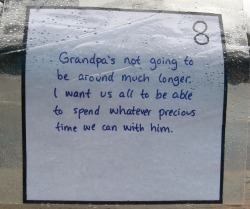 I want myself and the kids to be able to spend whatever precious time we can with him. 8. It's their decision. I just think the right thing to do would be to stay here for a few extra hours, especially since they don't get to see their Grandparents very often. 9. It makes me sad to see them go for the weekend. I miss them. The house feels empty. 12. Their father's never been known for his communication skills. 16. I told their father last month that I wanted to have the first two weeks of August with them but now he tells me that he already bought plane tickets for his trip with them for the tenth. 18. He seems to expect that I can be totally flexible with our weekends, and just switch them around last minute, but I've already made plans for us and arranged things with other people. 19. I will ask the kids to ask their father when he's planning to go on vacation with them this year. 27. I feel guilty about the kids getting caught in the middle of all this. I've always felt like it's been an competition between their father and I over spending time with you, and we both want it our way. 31. He thinks that just because they live with me that I get to spend all this quality time with them. But mostly we're all so busy with work, school, and all kinds of after-school activities that I hardly get to sit down and spend time with them either.